Crews run the DB-60 whenever the mobile crusher is operating, blanketing material piles, storage areas or truck paths to best suit the day’s workload and wind conditions. The unit is easily set up by one person, and can run all day unattended. With the significant drop in fugitive dust, TCL is contributing to a healthy workplace and helping to safeguard the surrounding community. The move also minimizes the opportunity for abrasive dust to enter air intakes on heavy equipment, helping to extend air filter life and reduce unnecessary engine wear. TCL has been a leading supplier to the Caribbean region for more than 50 years, currently averaging about 1.1 million metric tonnes annually from its Claxton Bay production facility. Limestone supply comes from the firm’s own quarry in Mayo. Containing 120 hectares of yellow limestone deposits, the reserve has been forecast to sustain anticipated production rates for 200 years or more. Like most quarries, the company faces some difficult challenges in its attempts to control dust during extraction and processing. Operations such as quarrying, loading, transportation and mobile crushing typically don’t lend themselves to integrated suppression techniques, yet all of these add to the potential for releasing vast amounts of dust. Hand watering dust suppression techniques also had a tendency to saturate the material surface and contributed to standing water, both undesirable side effects. Even with dust screens and vegetation to help create a containment barrier, company officials believed there had to be a way to better suppress airborne particles and contain surface dust, without the saturation problems and manpower requirements that typically accompany hand spraying. The primary target for improving dust suppression at TCL was the mobile crushing unit. The company uses one of the largest tractor rippers in the Caribbean to extract raw limestone, the Caterpillar D11R, and the quarried stone is trucked to a Hazemag impactor with a capacity of 530 tonnes per hour, which crushes the rock to an average size of 25 mm. To control the airborne dust generated from crushing and transporting, TCL selected a DustBoss 60 (DB-60), which uses a series of 30 specially-designed brass nozzles to atomize water droplets to the optimum size for maximum particle attraction and coverage area, then launches them with a powerful 25 HP fan. In contrast to most suppression equipment suppliers, the company offers a wide range of nozzles for different applications, selecting the optimum spray pattern and droplet size to suit the specific type of dust being addressed. The ducted fan delivers 30,000 cubic feet (about 850 cubic meters) of airflow per minute through the barrel, giving it a throw of more than 200 feet (60+ meters). It can also be equipped with a 10 HP booster pump to increase water pressure as high as 200 PSI from a 2" supply hose. The DB-60 has an adjustable elevation from 0-50° and the oscillating head delivers 40° of motion. The workhorse design can cover nearly half an acre (.2 hectares) from a single location, and the wheeled carriage-mounted mobile unit can be easily located wherever it’s needed most on a given day. The unit’s suppression efficiency derives from its ability to balance a number of critical properties that tend to work against one another, such as droplet size, spray pattern, air flow, range and velocity. If spray nozzles create large droplets, they can be thrown a longer distance than small ones, giving a unit more range. “Unfortunately, large drops have a lower capture rate and more space in between, making them less efficient overall. The optimum condition is when the water droplets are approximately the same size as airborne particulates, producing the greatest attraction between the two,” he said. The results at TCL have been excellent, and the versatility of the dust control design allows crews to quickly adjust positioning, throw angle and oscillation to accommodate specific work sites and weather conditions. 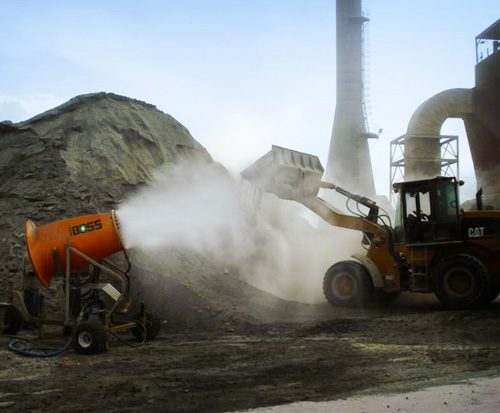 Find a way to knock down airborne particles and control surface dust with greater effectiveness than hand spraying, contributing to a healthy workplace and helping to safeguard the environment surrounding TCL’s limestone quarrying and crushing operations. The DustBoss® 60 (DB-60), a powerful ducted fan design with a 25 HP motor that generates 30,000 CFM, capable of covering as much as 21,000 square feet (1,950 square meters) with a fine mist of atomized droplets for outstanding dust control. TCL reports an immediate and significant reduction in airborne dust and the versatility of the DB-60 allows crews to quickly adjust positioning, throw angle, and oscillation to accommodate specific work sites and weather conditions. The move also minimizes the opportunity for abrasive dust to enter air intakes on heavy equipment, helping to extend air filter life and reduce unnecessary engine wear. has been a leading supplier to the Caribbean region for more than half a century, currently producing over a million metric tonnes per year from its Claxton Bay facility Bay. The firm provides six different cement products, including ordinary, premium and specialty grades, using wet processing technology. This entry was posted in Aggregate Handling, Bulk Material Handling, Crusher, DB-60, DustBoss, Mining / Quarrying, News. Bookmark the permalink. Both comments and trackbacks are currently closed.